Last night, I spotted a tweet from simms22 linking to a video of the Honeycomb boot animation on a CM7ed Nexus S. This morning I awoke to a tweet from him with a link to download it. Update: about an hour ago, simms notified me that the original animation is the work of XDA member zul8er, and tnpapadakos then released an updated (fixed) version. I think this is the first time I've ever seen his pretend pervertedness actually pan out. The best part? It's not really just limited to the Nexus S... or even CM7, apparently. I've successfully put it on my EVO, and at least one person has reported putting it on their stock (rooted) ROM. Even better, installation is dead simple. Before I say how, though, the usual disclaimers: this has not been thoroughly tested. I haven't seen anyone other than myself flash it on a device other than the Nexus S, meaning I can only confirm this works on the EVO and Nexus S. I can't confirm which ROMs this does and doesn't work on, aside from CM7 and stock Nexus S see the update below. With all that said, I will say this doesn't strike me as a very risky mod (you're just manually overwriting bootanimation.zip), and if you back up the original beforehand, there shouldn't be much to worry about. Again, it should work on any rooted device. download the boot animation. using root explorer, copy this bootanimation.zip to the /system/media/ folder. yes, copy over the one thats already there. then just reboot. YOU are doing this to your phone, not me. DO NOT FLASH THIS, YOU HAVE BEEN WARNED.as i didnt flash it so im not sure that you can. Once again, I'll say this is very easy, but there is some risk involved. If you give it a shot, please let us know what device and ROM you're using and how it went. I'll update the post if/as needed based on any feedback we receive via the comments. 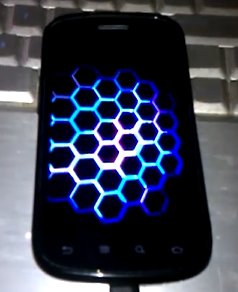 Want to give your CM7 device an even bigger injection of Honeycomb? Try out the Honeybread theme - I've been using it since the first alpha release, and it started out great and has only improved since.